This week’s Future of Work podcast features a conversation with Steve King, a partner at Emergent Research. Steve has extensive consulting, marketing and general management experience with both large and small companies. He has served as vice president of Corporate Marketing for Macromedia, vice president and general manager of Asia Pacific for Lotus Development Corporation and vice president of marketing for Isys Corporation. 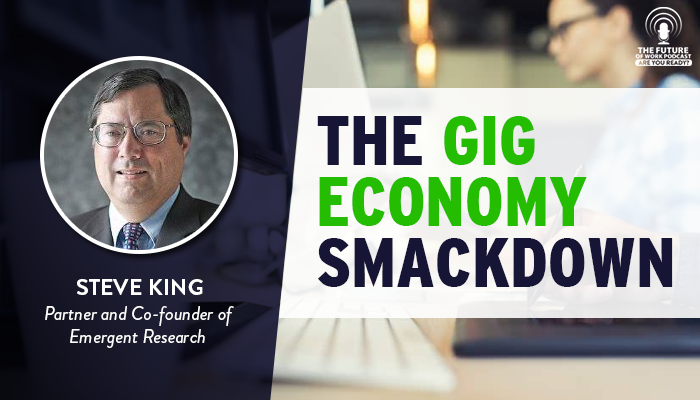 Steve’s current research and consulting is focused on the future of work, the rise of the independent workforce and the impact of Big Data on small businesses. Some research shows a low number of independent workers – less than a million people to a high number – 75 million people. The 75 million includes people that have taken surveys online and received payment for it or play a game and get paid for it. So, it is critical to define work when discussing the number of freelance workers.